Stone Information: Mystic Merlinite is the name given to a unique mineral composed of Quartz, Feldspar and several trace minerals. 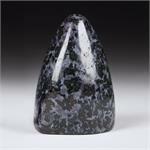 Its color is a swirling blend of black and white. It was discovered in Madagascar. 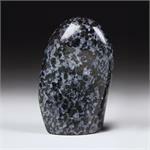 Metaphysical Healing Properties: Mystic Merlinite can part the veils between the visible and invisible worlds, opening the doors to deeper intuitive abilities. It can facilitate opening the dormant areas of the mind. For those wishing to work with elemental energies for magical manifestation or awakening to mystical experiences, this stone can be a powerful ally. 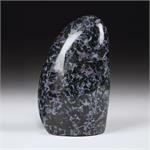 The black and white mixture of Mystic Merlinite symbolizes the Light and Shadow sides of the self, both of which one must embrace in the moment of inner awakening.